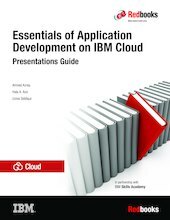 This IBM® Redbooks® publication is designed to teach university students and app developers the foundation skills that are required to develop, test, and deploy cloud-based applications on IBM Cloud. It shows the latest features of IBM Cloud for developing cloud applications, enhancing applications by using managed services, and the use of DevOps services to manage applications. This book is used as presentations guide for the IBM Skills Academy track Cloud Application Developer and as preparation material for the IBM professional certification exam IBM Certified Application Developer - Cloud Platform. The primary target audience for this course is university students in undergraduate computer science and computer engineer programs with no previous experience working in cloud environments. However, anyone new to cloud computing or IBM Cloud can also benefit from this course.